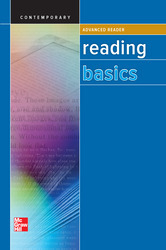 The Reading Basics Advanced Reader includes 15 high-interest nonfiction articles that cover topics including storm chasing, high-rise window washing, Sherpas, Delta Force, spacewalking astronauts, and more! Three graduated reading levels within each book are organized into three units of five lessons each. Key words are defined in the margins; six exercises per lesson strengthen comprehension and critical reading skills.